In a Dutch oven, cook fettuccine according to package directions, adding corn during the last 8 minutes of cooking. Meanwhile, in a small skillet, heat 2 teaspoons oil over medium-high heat. Add red pepper and green onions; cook and stir until tender. 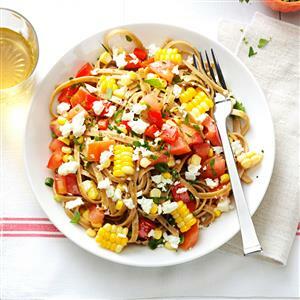 Drain pasta and corn; transfer pasta to a large bowl. Cool corn slightly; cut corn from cob and add to pasta. Add tomatoes, salt, pepper, remaining oil and the pepper mixture; toss to combine. Sprinkle with cheese and parsley. Yield: 4 servings.